31/5/12 - Internet - Getty Research Institute - The Getty Research Institute is launching an extraordinary website with the help of many other institutions . 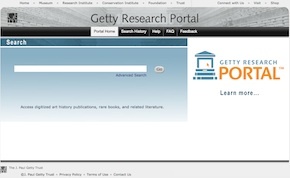 This new platform is called the Getty Research Portal, providing easy access to thousands of art history texts which can either be read online or downloaded. The search motor already offers 20,000 works, a number which will increase regularly. These are all books which have become part of the public domain, a very complex notion for an international database as the concept varies according to each country and is not the same for instance in the United States as in France. In the former, anything published before 1923 is now in the public domain whereas in France the author must have died over 70 years ago (unless the work was published posthumously). Since the portal serves as an interface for finding digitized works located on partner sites, we were able to access texts which in France are subject to copyright restrictions and others which are still under American ones. Users can also download, for instance on the INHA website, works with rights which theoretically have not yet expired in France such as volume VI (Gillot-Ingres) of French drawings at the Louvre and Versailles, published in 1911 by two authors who died respectively in 1952 and 1953. We are delighted to welcome this new source. This portal is thus a fundamental tool for art historians. Although we will always prefer real books to electronic works, it is obvious that in the case of old texts or those no longer published, this opens up infinite possibilities for professionals and amateurs alike, notably thanks to tablet computer access. The motor is particularly well designed. Searches can be made, as usual, through just one field or thanks to an advanced search form which includes a key word, title, author or subject. Results can then be extended by applying any of the criteria listed on the left side column. Search history can be saved and consulted again but this function does not seem to work well at the moment since when we clicked on one of these searches, an error page popped up. Finally, we would like to point out that when several copies of the same work are digitized by different institutions, they are all available. Digitized quality varies for each and they can in some cases also provide interesting and of course unique, handwritten annotations. Users can find help here. This portal is funded by the Getty. Its partners are currently : the Frick Art Reference Library, the Getty Research Institute, the Heidelberg University Library, the Institut National d’histoire de l’art, the Biblioteca de la Universidad de Málaga, the New York Art Resources Consortium (including the Brooklyn Museum and the Museum of Modern Art), the Thomas J. Watson Library at the Metropolitan Museum of Art.